Description: Miniature county map of Hertfordshire. Coloured. Description: One of the earliest available county maps of Hertfordshire based on the first systematic survey of England and Wales. Coloured. Description: County map with various cartouche and crests. Coloured. Description: Attractive and rare map of Hertfordshire. The dedication on the upper left is to James Cecil, Earl of Salisbury, whose family home is Hatfield House, close to St. Albans. Description: Rare map of Hertfordshire decorated with two large cartouches, a compass, and a splendid coat of arms belonging to the dedicatee, Arthur Capell, 1st Earl of Essex. 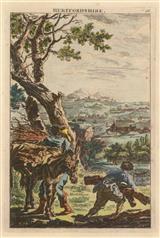 Original hand-colour. Description: Miniature map of Hertfordshire with decorative border, description of the county and listing distances from London to Wells. Coloured. 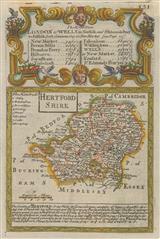 Description: Grand county map of Hertfordshire with decorative cartouche and dedication and descriptive text panels. Published in Kitchin's Large English Atlas. Original hand colour. Description: Hertfordshire, highlighting cities and towns and with a decorative cartouche. Coloured. Description: Map of Hertfordshire taken from Bowens landmark survey of Georgian England. Interesting note marking the birth place of the only English Pope, Adrian IV. Original colour. Description: Charming county map. Original colour. Description: Decroative birds's eye view of the county of Hertfordshire. Coloured. Description: Beautiful example of Georgian Hertfordshire with an extensive road network and wonderful topographical detail. Original colour. Description: Attractive map of the county of Hertfordshire highlighting the developing road network during the Industrial Revolution. Original hand colour.